Truthfully my mom never decorated for Halloween. We carved pumpkins, but that was about it. Now that I have children of my own, I have to dress up for Halloween and decorate. 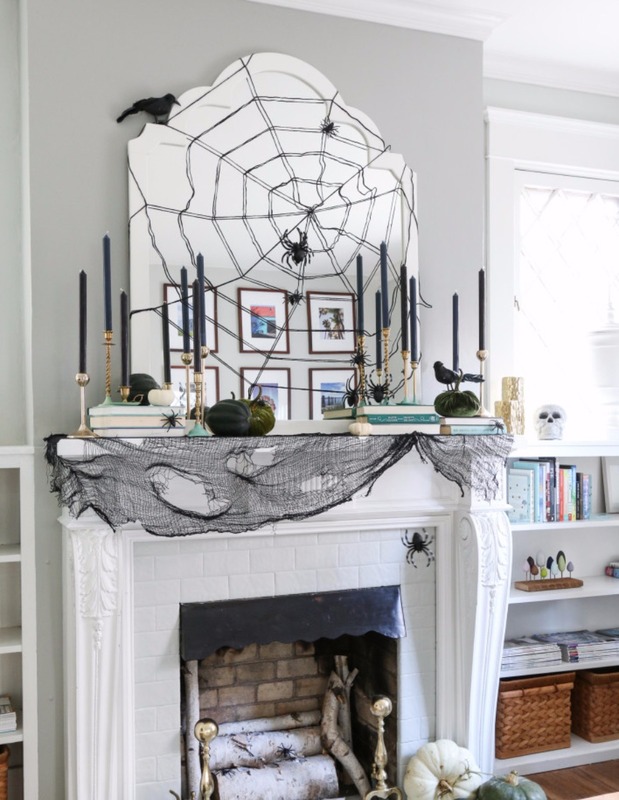 I definitely do not want to be a stick in the mud so I have been hunting for easy ways to decorate for Halloween. 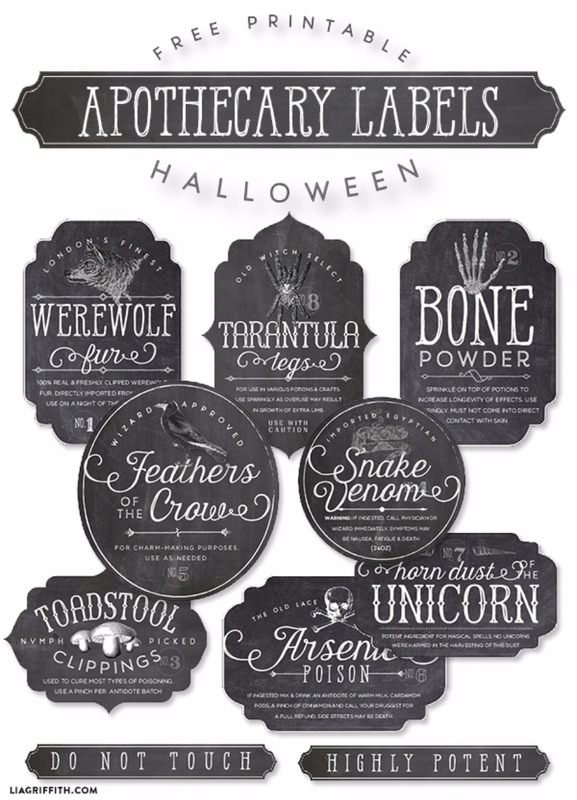 Here are a few that I'm going to try in order to make my house SPOOKTACULAR! Starting off, I'm going to decorate my mantle like Inspired By Charm. All I need are some gold candle sticks, black candles, a cobweb, some spiders, bats, crows and a few velvet pumpkins. 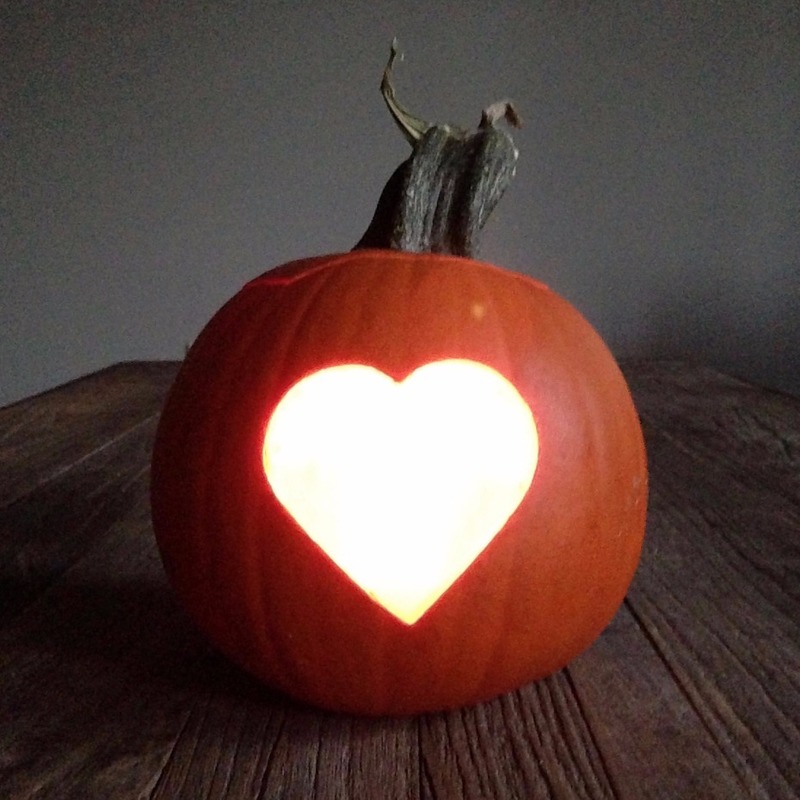 Don't want the mess of carving a pumpkin? 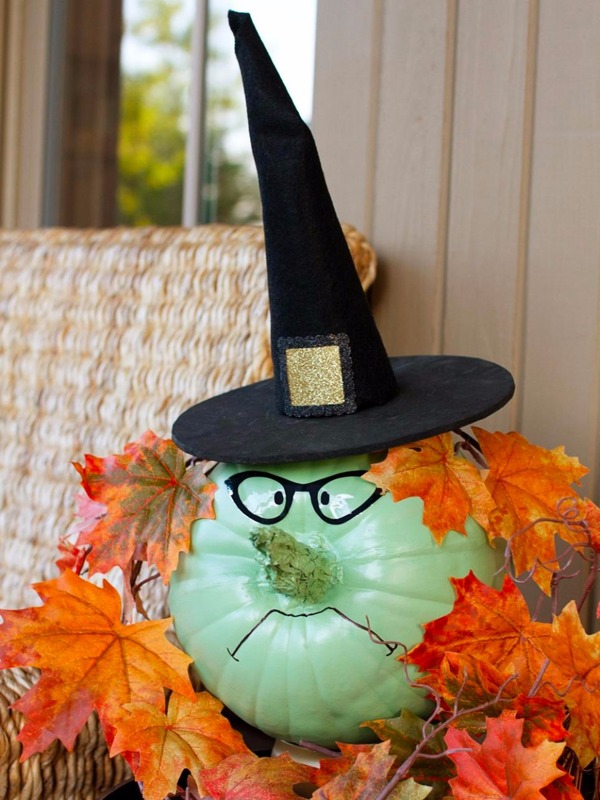 Try something like this not-so-scary green witch pumpkin. She won't ever rot by the way. I am so getting this. Make anything spooky really quick. 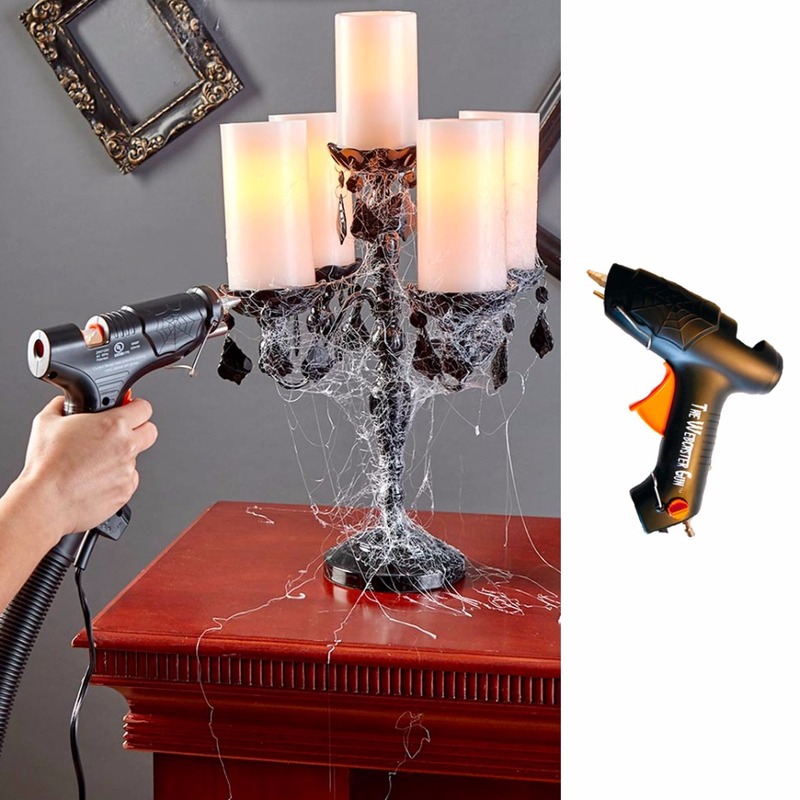 This handy little gun makes real-looking spider webs instantly. You'll need to attach to a vacuum for it to work. Get spider web gun here. 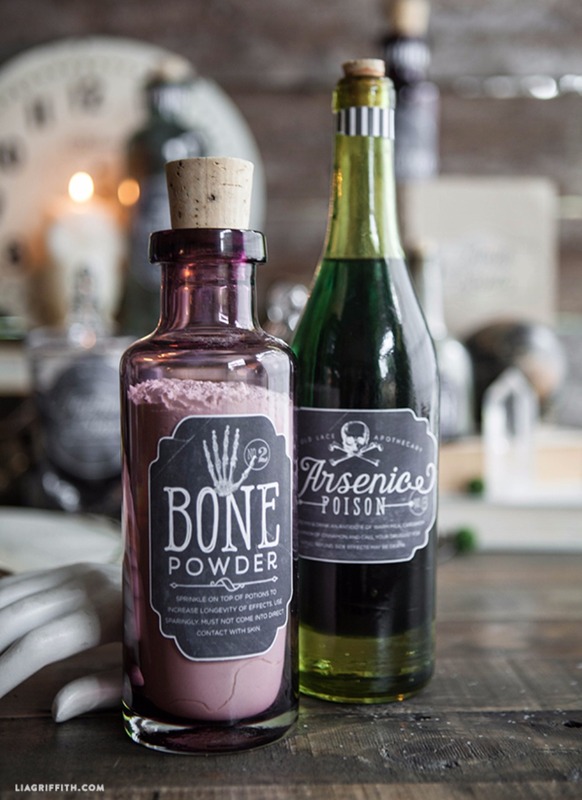 We know you have a bar cart and we hope that you will decorate it for Halloween. 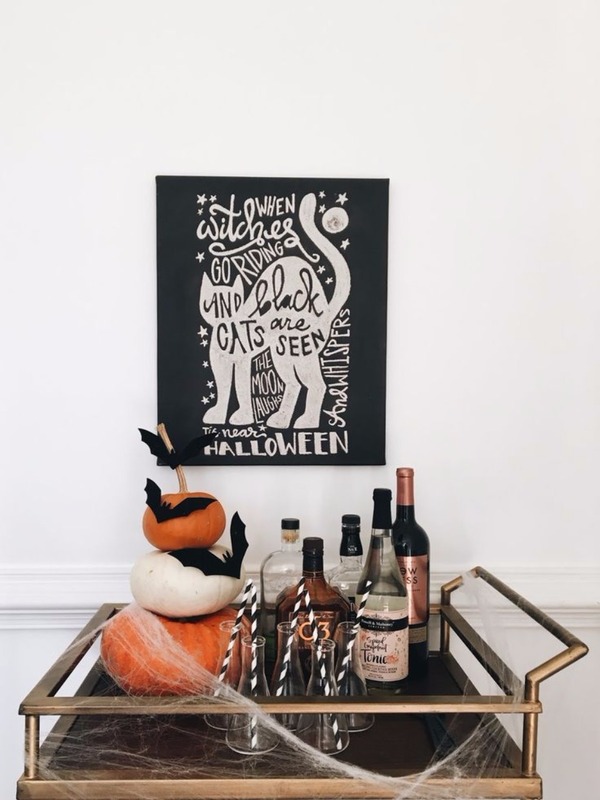 You can add cobwebs, pumpkins, beekers with striped straws for a super scary bar cart. You can see how Garvin and Co. decorated their entire home for Halloween. 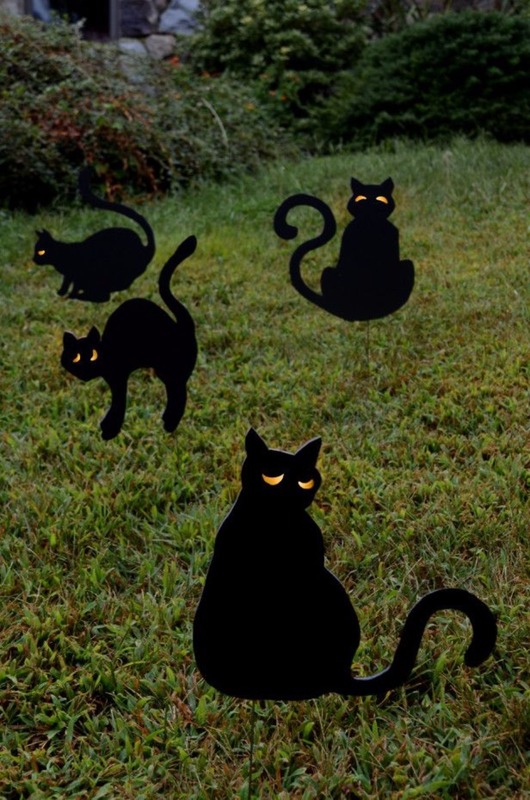 For all you cat lovers out there, this is the Halloween decoration for you. We could not find these exact kitties but found an almost purr-fect match here. Amy made this a few years ago, and lucky for us she saved it in her camera roll. To this day it is my favorite favorite pumpkin design. This is how to make it ... and please do it. Here are some various sized heart cookie cutters you can use. Ok ... this is so funny and has to be one of my favorites. 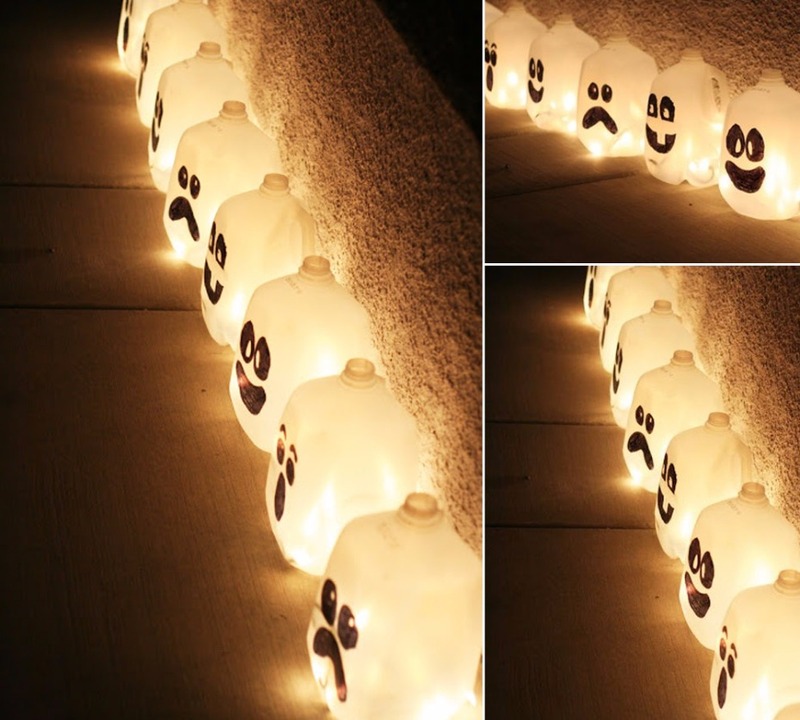 These Spirit Jugs are easy to make and so funny. Start chugging milk now and asking your friends and neighbors for their used cartons so this can happen on your front porch immediately. Here's the tutorial. 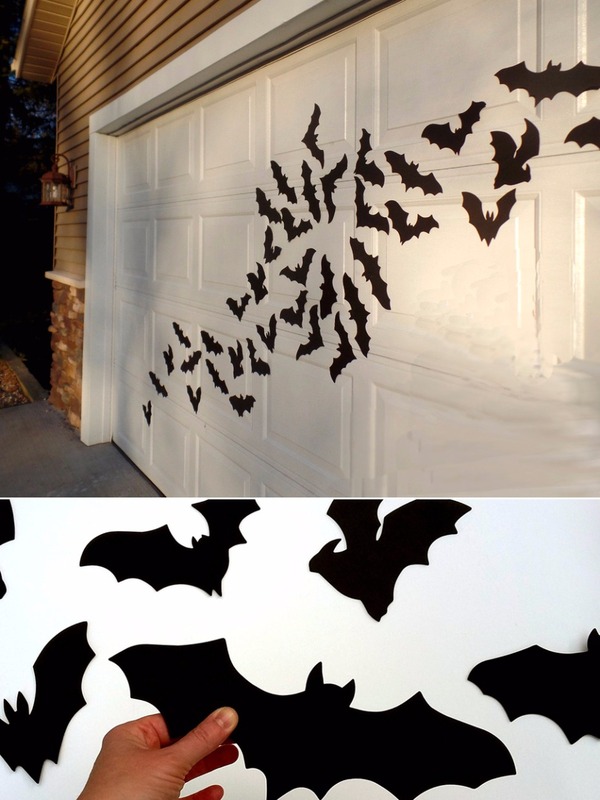 I also feel like I need these waterproof foam bats to decorate my garage. You get 16 bats in a pack and you can reuse them every year. Sold! After that I am going to sit back in my lawn chair and pass out a Spooky Halloween Snack. I don't know about you, but I have a ton of empty bottles around the house and am going to print out these Free apothecary printable labels to put on a few of them. These are going to look spook-tactular on my mantle. Ok... technically this dos not look too easy, but if you are feeling really crazy and Halloween is your absolute favorite holiday then you should do this. 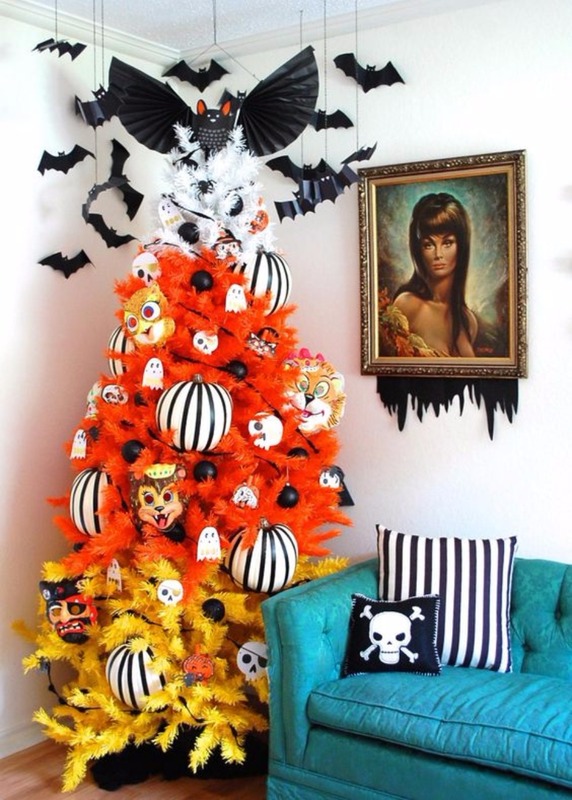 Decorate a Halloween tree with plastic pumpkins, black spray painted bulbs, scary masks and then top it off with a bat. You can learn how exactly to do it here and see more Halloween trees.